Nail Polish Lover, this is a giveaway that you shouldnt miss!! Wish to own a Nicole by OPI? Here is your chance now! Secret Allure is having their first giveway. 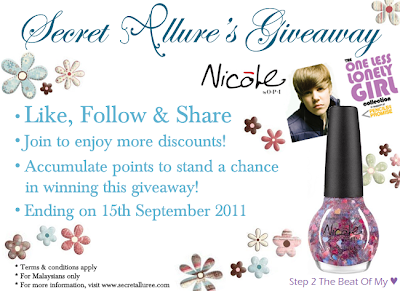 Join and stand a chance to win a Nicole by OPI Step 2 the Beat of My Heart and enjoy more discounts. Click here to fill up the participation form! The giveaway is point based. Collect as many points as possible and you might just be one of the two lucky winners! 2. Blog about this giveaway with the link to our website. 3. Retweet this giveaway "Enter Secret Allure's Nicole by OPI Giveaway! Winner gets a Nicole by OPI nail polish and 15% discount promo code!! http://bit.ly/nfTA2q"
5. Be a follower of our website. *Giveaway ends on 15th September.